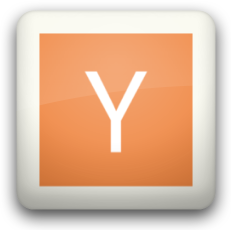 I'm a huge fan of 2 community news sites - Reddit and the more technical/nerdy Hacker News by YCombinator. 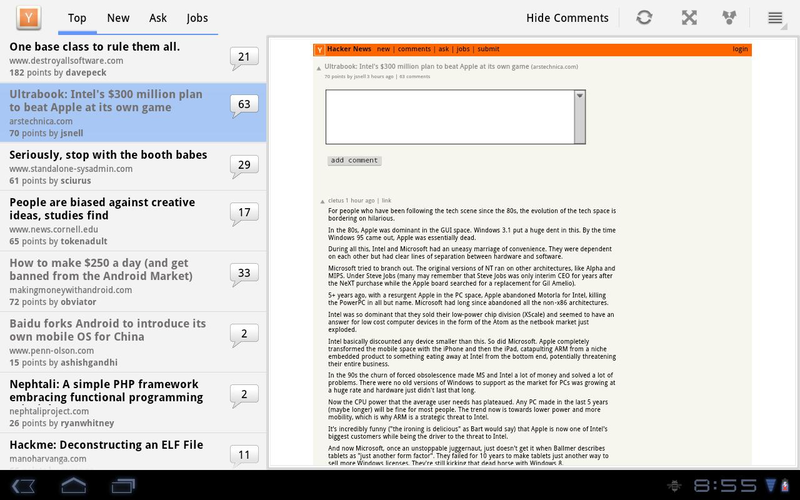 The former has a few tablet apps but Android users haven't had as much luck with Hacker News apps for tablets. The website, while fast and looking just fine in the browser, is far from optimal for those using a touch interface with its tiny links to discussions and buttons. 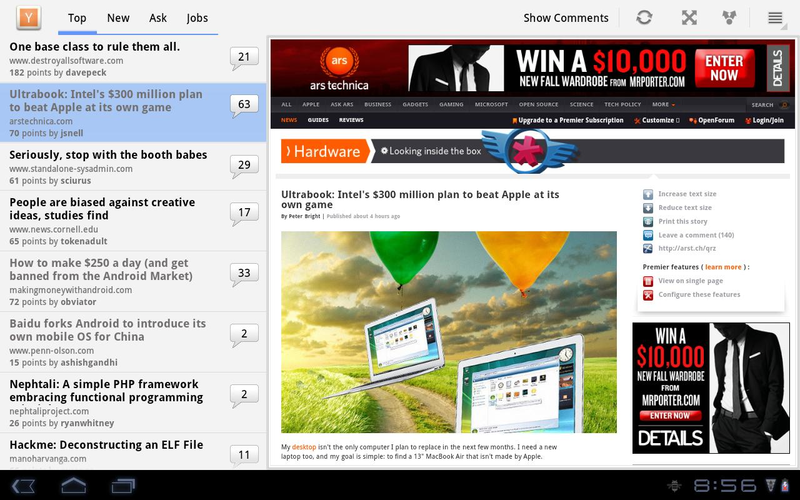 Enter the new HackNewsBot app by Jason Ostrander, designed specifically for Honeycomb tablets. We have the independently scrolling list of stories on the left which can be toggled on and off to make room for the browser on the right. The app keeps track of the read/unread status for each story - read stories are gray while unread ones stand out in black. 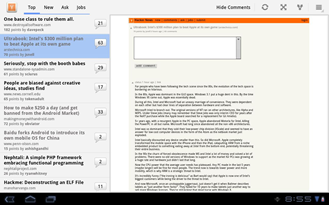 Each story title is linked straight to the corresponding article, and conveniently large comment indicators on the right not only clearly show which stories have the most heated discussions, but also link to dedicated HN comment pages. The number of points along with the submitter name is shown below the title. A convenient selector at the top of the article list allows picking of Top, News, and Ask HN topics, along with Jobs (I never even knew the latter existed). Unfortunately, there is no built-in login system, which means there are no native upvotes within the app, but I was able to log in using the browser window on the right and then subsequently vote articles up. It's not ideal, and I even suggested native authentication to the author, but it will definitely do for now. I would also like to see the number of points highlighted a little better, but it's a minor complaint. 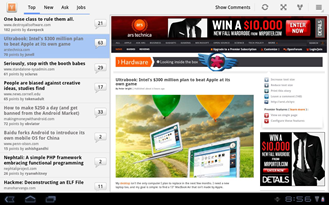 All in all, HackNewsBot is not only a really impressive and polished first release of a Honeycomb client for Hacker News, but it's also the best one you will find on the Market right now. Oh, and did I mention it's free? Bravo, Jason.